Thanks for Mark and Slinky Dog for posting/results. Congratulations to Mark and Slinky Dog. I'm hoping next year to watch a few of these people skate. I really don't know Mark or Slinky Dog, but I know the events they skate, so I can look them up next year. I agree with Slinky Dog, those solo dance events can be killer. I placed 17th out of 35 in Solo Dance for old people....Div 2, Bronze. So, that isn't to good lol! But I had fun. Those solo girls are just so smooth and in Slinky Dogs' Solo Dance, I know in the SW Pacific they are real tough competitors and beautiful to watch. It's really fun to watch those events. I thoroughly enjoy watching them skate. In figures I won...lol! A lot of scratches, but a win is a win and the metals are huge and beautiful. Really nice metals...lol! So I guess I am a National Champion in Div 2, Bronze Mens figures...lol! Take Care everybody and I'm think of skating Singles next year. 2 jump combinations, maximum of 3 jumps. Maximum of 3 spins, in which 2 may be a combination/change spin (may use camel and sit positions). No repeated items (spins or jumps) unless used in the combination. One sequence of primary, secondary, or advanced footwork must be included. Sincerely, everybody and good health to you! Thanks Jim and Rick. It was a great year! Can't wait for next year to start. I'm ready to go...lol! year we will compete at those dances either locally, Invitational or Regionals. It just didn't happen this year and I just wasn't ready for them. Got a whole year to rectify that problem...lol! Congrats to Slinkydog (Brock) and Larry at Nationals! Slinkydog was crushing it at Nationals. He was in the same Fresh/Soph B division as me. Thanks for letting the old guy skating with you young guys! I didn't do as well as I wanted at Nationals but I still had fun. Nerves got the best of me in figures and loops. I tied for 13 in figures, loops I won't even talk about (Lol) but I was quite happy with freestyle. I made it past eliminations but ended up placing 6th due to a fall. Still I was happy how I did and look to work even harder for next year. I have the option to skate freestyle in either Novice, Classic, or Fresh/Sophm but I think I still stick with Fresh/Soph one more year. The young guys make me challenge myself even more to do better. Plus there usually aren't a lot guys in the adult meets until Regionals. BTW Larry, didn't know you were at Regionals! Next time smack me on the back. Lol. At Nationals I got myself a new Giottos figure plate with some new Star HD wheels and an Edea Jazz boot for my old Atlas Inline plates. When I got back home I mounted them both. I must say I love the responsiveness of the Giotto plate for figures and loops. Why didn't I switch sooner! It also feels good to be back on my artistic inlines. My old boot was broken down too much in the ankle and I was scared to jump on it. Now that meets are over for a while, it's time for me to get back to some basics, learn some new stuff and keep analyzing my techniques to make me a better skater. I plan share my findings so I'll write some more blog posts as well as do some video captures really soon. I would love to eventually try artistic inline, and I never knew Atlas ever made an inline frame before talking to you Mark! And after watching Collin Motley and his sister do double axels on them I've been even more tempted to get some Snow Whites with Edea Jazz boots. 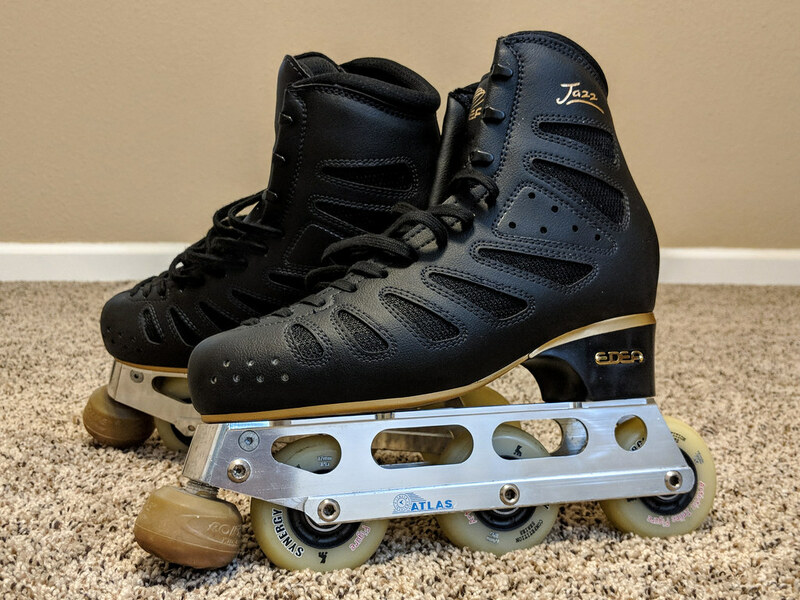 Let me know how you like those boots, based on the Edea Jazz boot I saw at the SkatesUS booth at nationals, they look very similar to the Edea Fly, just a bit more stiff (80 instead of 50). Thanks for the post Mark and Brock! Plus there usually aren't a lot guys in the adult meets until Regionals. I agree. In Southern California, there is only one boy who skates singles in Classic. He is 61 years old. I met him and his coach and look forward to skating with him in 2019. I will not beat him…lol, but I hope we have a lot of fun skating together. Mark, I was sitting right next to you and I did talk to you and your wife just a little bit in passing. I was the Asian guy with no hair…lol. You might remember me, but in any case I hope to see you skate Figures and loops and singles next year. And possibly maybe even see your wife skate???? I don’t know her intentions. I don’t think she skated this year??? At Regionals???? SW Pacific Region. At Nationals I got myself a new Giottos figure plate with some new Star HD wheels ... When I got back home I mounted them both. I must say I love the responsiveness of the Giotto plate for figures and loops. Why didn't I switch sooner! I have skated on the Giotto plate and I think it is an excellent plate. But a plate I like which is no longer available is the Roll Line “Ring”. It’s known as a loop plate, but I use it for Big Circles doing just the simple, no turn figures. I have a friend who skates loops and Gold Div 2 figures and he swears by the Hudor Plate. He got them this year and loves them. I think he uses different cushions for top and bottom. This same person also uses the STD Dance plates and he loves that plate over the Roll Line Dance plate. How are those Star wheels. A friend bought some for Nationals, but I don’t know how she liked them. She wants to go back to Roll Line Ghiotto figure wheels????? Look forward to you blogs and video clips. I know exactly who you are now! Look forward to seeing you the coming year! As for my wife, you'll probably never see her skate competition. She is actually very good at figures and dance but she beats herself up way too much when it comes to skating. She wants it to be perfect and if it's not right then she can get quite frustrated. She is getting better each day but when it comes to doing stuff in front of people or a judge she forgets everything. Lol. Test centers are about her limit right now. I worked with her on a lot of things over the past few years and she is getting stronger and more confident each day so perhaps that will change one day. I've heard good things about the Ring plate. Too bad it's no longer available. I would have loved to try it out. I am satisfied for now with the Giotto plate. It's way more responsive than my old atlas figure plate (and lighter to boot)! As for Star wheels, I've been on the same set of Star HD 80 wheels since 1996! They still roll great with no flat spots. My wife has wanted to steal my wheels for years. I let her try them one time and she didn't want to give them back. Lol. My only problem was that when I got to the National floor they were slipping like crazy. I bought a new set that gripped a bit more and I only used two of them for push wheels. I have them mounted on the left and right foot, inside big toe wheels. The rest of the new wheels I put on my wife's figure skates along with two of my leftover old wheels. She's happy now and can stop trying to take mine. I noticed a lot more skaters on Star wheels this year vs last year. I tried the Giotto wheels but I had a love/hate relationship with them. They were great for 3 turns but slipped to much on the takeoffs which brings me to an upcoming post. I finally broke down pushes and takeoffs to make them a lot easier, more powerful, faster, more stable with no slipping. Even wheels that grip can slip on a tight floor. I'll have a post about it in day or two! Loving the Jazz boots!! I'm still breaking them in but they feel just like my Flys but stiffer. For those who have never seen the Atlas Inline plate, here it is in the wild! While it has been ages since last online here, I thought it best to read up and see what our up and coming representation will be looking like. I am so happy to hear there are those that have decided to take pairs as their passion in Artistic skating. PS. Hi, there Rick! I am so happy you are still here with the forum. Hello PastSkater, glad to see you posting...lol! I have read your posts, but I don’t think I was around when you first posted. Sorry to say, I don’t think there are many Pairs Skaters in the U.S.
As an example I think there were only two teams in JrWorld Class and I think only one team in World Class, at this years Nationals. That ain’t to much…lol! I did have chance to see Chance and his partner at SW Pacific Regionals and I think they are a good example of the skating, the talent and the future of Artistic Skating. They are fun to watch and they have grown so much in the last year. They seem to skate singles, pairs, Creative Solo/team/solo, quartets and Show/group numbers. They are quite fun to watch in solo form, couples/pairs or quartets and team/group or show group. They are very "artistic" and have a lot of showmanship and creativity! They always seem to tell a "story" when they skate. That is skating to a very "high" level to me??? From my perspective it's the absolute fun for me to participate and watch the Adult Divisions. There are many Champions who were Champions 40-50 years ago and still skating today. That is what is amazing to me??????? And many of them skate at my home rink...FVSC. Thanks Mark for all your post(s)...lol! I noticed a lot more skaters on Star wheels this year vs last year. I tried the Giotto wheels but I had a love/hate relationship with them. They were great for 3 turns but slipped to much on the takeoffs which brings me to an upcoming post. Thanks for your post(s). They are so informative and helpful. The photos are great…lol! A picture tells a thousand words. I love those Inline skates. I guess you can’t get those Atlas Inline skates anymore? I know there are other really good inline roller skates out there. I see people skating on them. I finally broke down pushes and takeoffs to make them a lot easier, more powerful, faster, more stable with no slipping. I’m only skating basic figures at competitions and I have been using the Komplex wheels. A green(gippiest) for the push wheel and the hardest wheels (yellow ones) for the rest of the wheels. I have had good luck with them but the wheels seem to wear funny and sometimes crack or split at the seams????? Even wheels that grip can slip on a tight floor. I'll have a post about it in day or two! This is a interesting observation. Patti decided to go back to the Giotto Wheels. She tried some Stars this year but felt she was slipping on the National floor. She tried them (Giotto Wheels) today and was slipping and asked if I had the Giotto 49D (grippy/blue) wheel. I did, so I will bring them in for her during the next session. She will try this Blue (grippy) wheel for the push wheel.